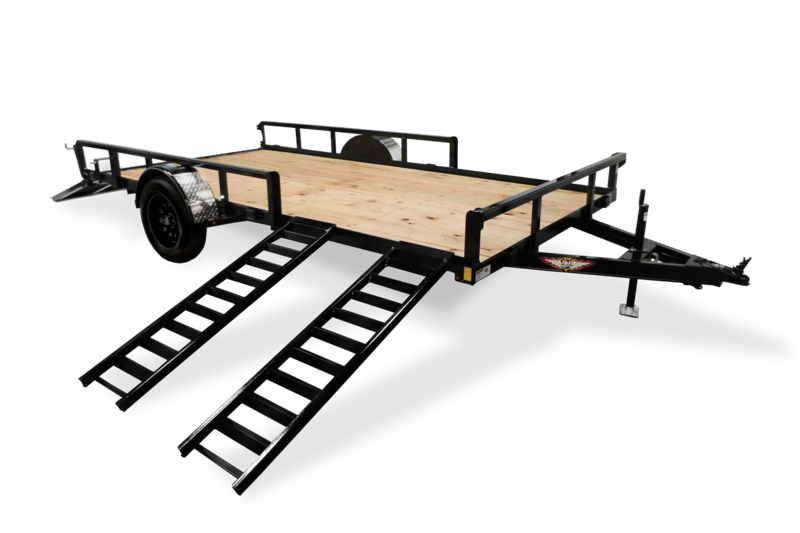 The ATV trailer sets the standard for functionality and durability. 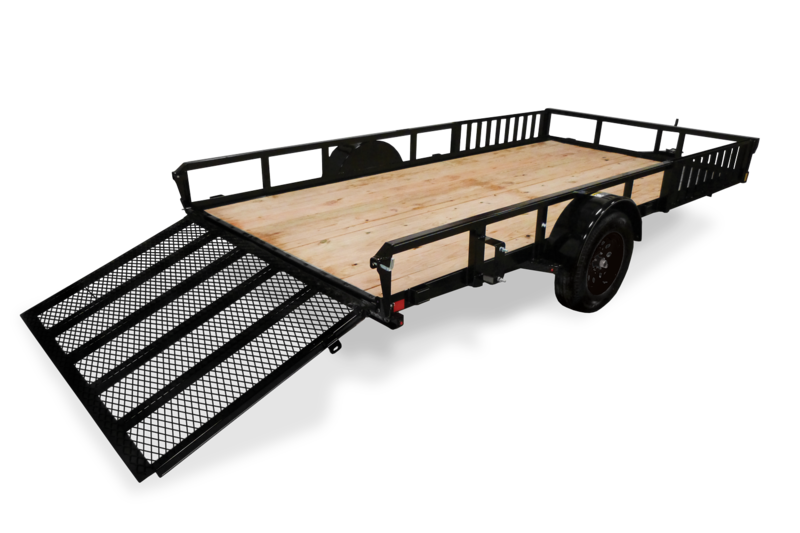 It features self-storing ramps so you can drive on or off from either side along with front storage. The rear ramp gate allows for quickly loading your ATV or UTV in the most efficient manner possible. Available in a variety of sizes in both single and tandem axle configurations. 82" x 12' SA 45"
82" x 14' SA 45"
82" x 14' TA 40"
82" x 16' TA 40"
82" x 12' SA 17 1/2"
82" x 14' SA 17 1/2"
82" x 14' TA 17 1/2"
82" x 16' TA 17 1/2"
82" x 12' SA 15"
82" x 14' SA 15"
82" x 14' TA 15"
82" x 16' TA 15"
82" x 12' SA 50"
82" x 14' SA 50"
82" x 14' TA 50"
82" x 16' TA 50"
82" x 12' SA 77"
82" x 14' SA 77"
82" x 14' TA 77"
82" x 16' TA 77"
82" x 12' SA 16'-6"
82" x 14' SA 18'-6"
82" x 14' TA 18'-6"
82" x 16' TA 20'-6"
82" x 12' SA 102"
82" x 14' SA 102"
82" x 14' TA 102"
82" x 16' TA 102"
82" x 12' SA 70 1/4"
82" x 14' SA 70 1/4"
82" x 14' TA 70 1/4"
82" x 16' TA 70 1/4"
82" x 12' SA 20 1/4"
82" x 14' SA 20 1/4"
82" x 14' TA 20 1/4"
82" x 16' TA 20 1/4"
82" x 12' SA 12'-0"
82" x 14' SA 14'-0"
82" x 14' TA 14'-0"
82" x 16' TA 16'-0"
82" x 12' SA 82 1/4"
82" x 14' SA 82 1/4"
82" x 14' TA 82 1/4"
82" x 16' TA 82 1/4"